Are you the type of person who likes to fill in worksheets? 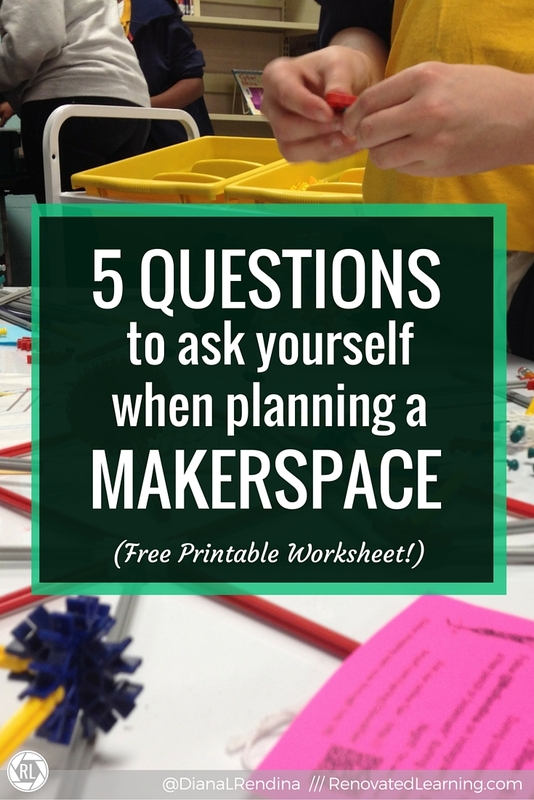 Click here to download a FREE printable 5 Questions worksheet! What are the goals of this Makerspace? Are you focused on getting students to exercise their creativity? Learn about electronics hands-on? Design and prototype their own creations? Practice engineering skills? While a Makerspace can do all of those things, some people want to focus on one domain more than another. Some are focused on providing exposure to technologies that students would never see otherwise. Some are more interested in creative expression through crafts and DIY. Both are valid. What does my school already have? The needs of a 1:1 school or a school where every single student has some type of device are going to be different from a school that doesn’t have functional wi-fi. Your library might already have an iPad cart. Your school might already have a robotics team or woodshop. Your science department might have bins of K’nex that they bought years ago that are just sitting around. These need to be considered as you put together your Makerspace proposal. How much physical space do I have? While the dream would be to have a dedicated room, most schools don’t have this much space. My growing Makerspace is one corner of the library. Some schools don’t even have that much. Consider how much room you have for supplies and where you’ll store them when not in use. There’s no sense in getting a ton of stuff if there’s nowhere to put it. Many schools are putting together Makerspace carts that can be put away when not in use. Will it be a mobile Makerspace that travels? Will classes come specifically to use it? Is it geared towards students who have a little free time? Or will there be a Maker Club? All of these need to be considered when figuring out what you will get. If it’s a drop-in-when-you-have-free-time Makerspace, LEGOs and LittleBits will be easier for students to use than a bunch of Arduino’s and soldering irons. If there will be a specific, regular group, more in-depth projects can work better. Where will I get the supplies? 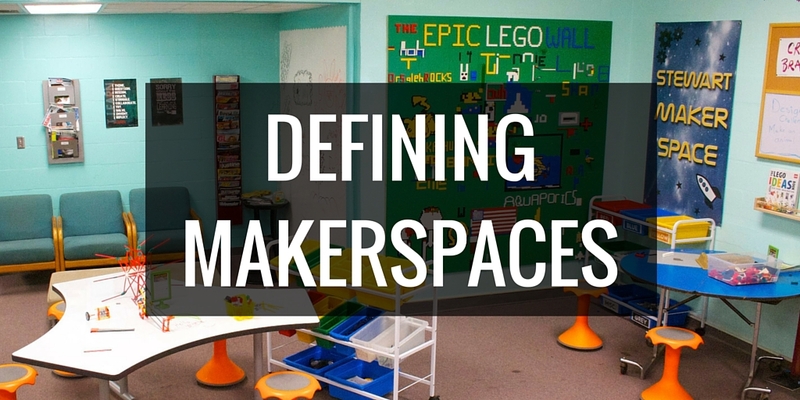 There’s so many different ways to outfit your Makerspace. You’re likely to have more success trying to get a few things at a time than writing a $10,000 grant. Focus on smaller grants, DonorsChoose projects, bookfair profits, etc. Also, see what you can get donated. Many stores are willing to donate broken electronics for a tech-take-apart station. Parents may have LEGOs sitting around their house that they’d be happy to give to the school. P.S. 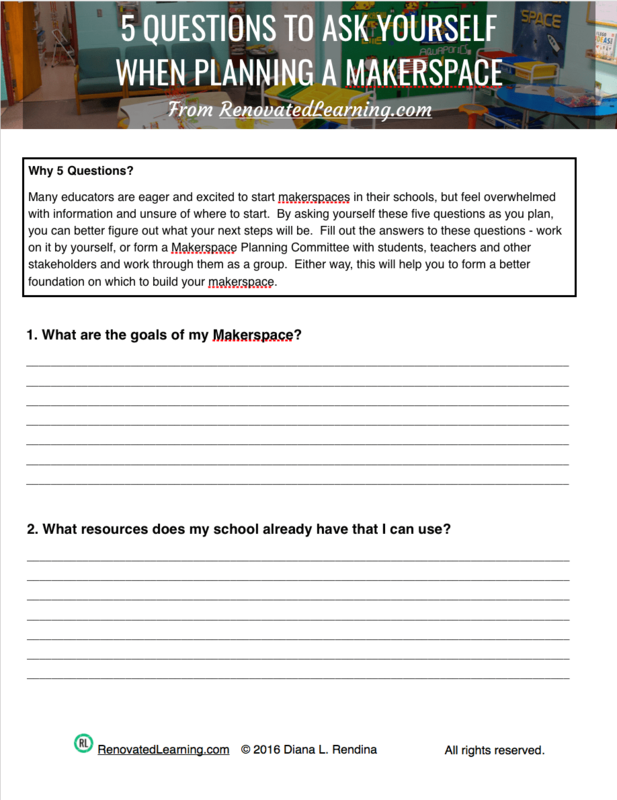 The first couple chapters of my book offer advice from myself and two other librarians on getting a makerspace up and running at your school. If you liked this post, check out Challenge-Based Learning in the School Library Makerspace. Great questions to consider! I have struggled with some of these myself. 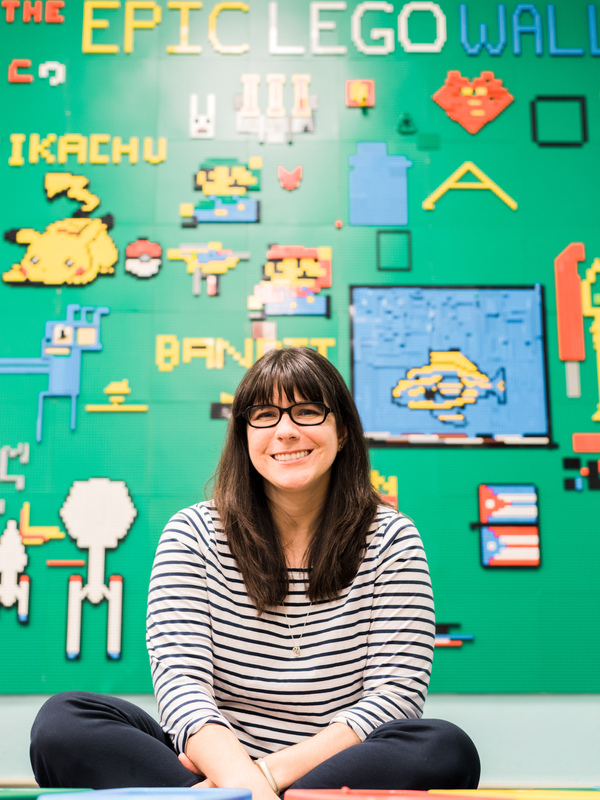 Hi Diana, Thank you – I’m finding your musings on makerspaces (and other aspects of your work) ever so useful in the development of our own makerspace. Just wondering about ventilation for 3D printing. I’m thinking of purchasing a DaVinci 1.0A printer and locating it in a room (the size of a classroom). The room is air-conditioned, but the windows cannot be opened. The printer will only be used occasionally. Would you recommend installing a ventilation system for the printer? I don’t have a 3D printer in my makerspace, so I’m not really the best person for this question. I’d recommend getting in touch with Josh Anima (@DesignMakeTeach). He’s awesome with 3D printers. We have a DaVinci 1.1 Plus 3D printer in our library. It’s been there since October 2015. We don’t have any special ventilation. It is fully enclosed, like the 1.0, and I haven’t noticed any specific odors using ABS filament. If you plan on using PLA, there may be more, so I would perhaps locate it near a window or windows that could be opened?